Jacob- so sorry to hear about your photo loss! What a bummer. Do you back up to an external drive? I lost a ton of work a little over a year ago, and as a result now back up regularly to an external drive- gives me peace of mind that if there are funky errors I haven’t lost all my hard work, only a day or so at most. 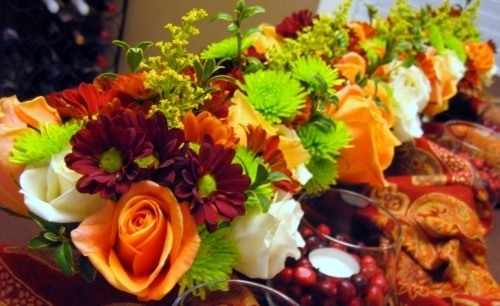 Your Thanksgiving meal looks beautiful- I love the table. And brined Turkeys are the best! Your family is very lucky to receive the fruits of your talents- at Thanksgiving as well as other times of year! Looking forward to reading more about your Holiday cooking! I do back up to an external drive. The pictures that I lost were still on the camera, and playing back perfectly fine for a long time. Then when I went to upload them all I could get was “card error” … and no pics. So I lost Thanksgiving, my birthday party, Christmas, and all of the holiday recipes that I shot over the last month and a half. Very sad. But c’est la vie. Nice to see you back, Jacob. What a horrible experience to lose all those pictures. I lost my whole computer to a virus on a birthday e-card a couple of years ago. It was a nightmare. I had to buy a new computer as we never could get the hard drive clean enough to be safe. I hope you get your pictures restored. The table photo is amazing. And the menu sounds wonderful. Late is definitely better than never. What a spread! Hope you have a happy and healthy New Year! Beautiful table! And that turkey breast sounds amazing! I’m sorry about your photos – I think I would probably have a bit of a nervous break-down if that happened to me! I love seeing pictures in my head. It’s one of the joys of reading! I hope 2011 is grand for you – even if 2010 ended with some sadnesses. A New year is rife with possibilities. May your possibilities come to fruition. Oh Jacob, so sorry to hear about all of your losses this season. I am glad to see you back. 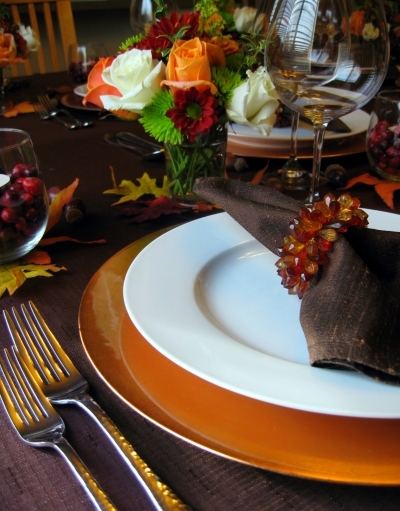 The table pictures look fantastic and the meal sounded delicious! Welcome back, Jacob! And best wishes for the new year. So sorry about the loss of your pictures. Your table was beautiful. Brinning turkey is the best, and especially your Herb Roasted Turkey Breast. Happy 2011, and I look forward to seeing more amazing recipes and pictures from your kitchen. Very glad to see you back. We had a strangely similar holiday season but it was a 31st birthday…I pray you and your family are doing okay after your loss. I LOVE the beautiful table settings. Here’s to a new start in 2011! Looking forward to more of your stunning photos in the future. I share your pain. After I took several hundred photos during our trip to the west coast, my darling middle child, while attempting to look at the most recently taken pic of himself, somehow thought he pressed NO when the camera sweetly asked if all the photos should be deleted. Oopsie. I love your blog everyday. Today I love your blog because you included these two catch phrases: preposterous amount of butter AND full bottle of white wine! Those are some winning words.